A couple of weeks ago, I went up north for business and enjoyed my off hours exploring the town. I found a quirky coffee shop on the south side of Main Street that was home to its own fabulous feline and a delectable drink called the MaryJean Praline. My explorations didn’t end with coffee. In fact, the coffee was the appetizer. As I walked along, snapping pics of flowers, iron fenceposts and old-fashioned looking signs, I discovered that there were four Asian restaurants on one corner. How entirely unexpected! There were two sushi joints, a Thai restaurant and an Asian cafe. Imagine that?! As I was taking pictures, wondering what would prompt these folks to open up the similar eateries on the same block, a man, sitting outside one of the sushi places, asked me who I was. Come to find out, he wanted to know what I was doing. I explained that I was there on business and was checking out his charming burg. It happened that he was the owner of the sushi restaurant whose sign I’d just captured on megapixel. He invited me to stop back for dinner when I’d finished my photologue… so I did. It was good to sit down after strolling through town in heels, and once I’d cooled down with a few sips of iced tea, I asked Michael, the owner, to suggest the two best sushi options on the menu. 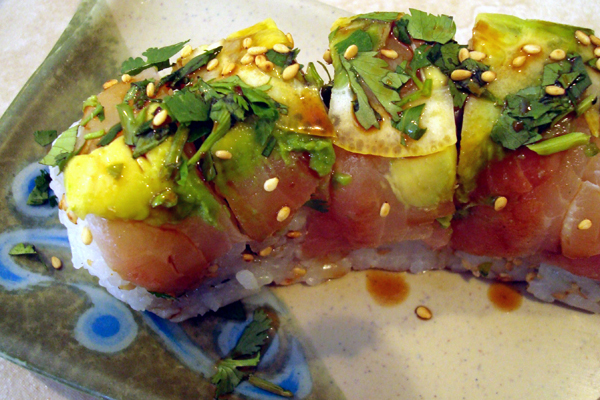 He recommended the Lilly Specialty Roll and the Nevada Specialty Roll. His recommendations were right on. The rolls were fantastic! They were both quite flavorful, very different but equally delicious. 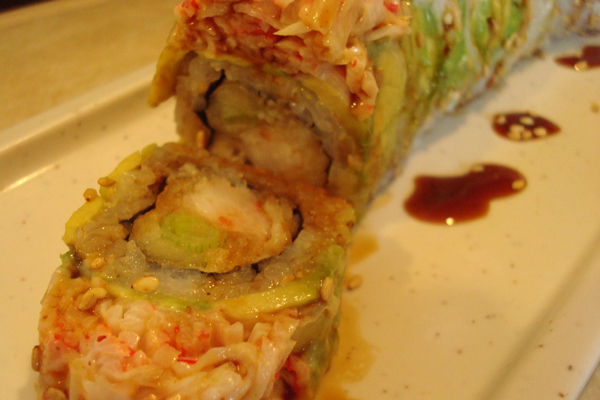 The Lilly was made with tempura shrimp and green onion, topped with avocado, spicy crab, sake and chives. The Nevada was made with crystal shrimp, white onion and jalapeno, topped with fresh halibut, avocado, cilantro, lemon slices and a special blend of sauces. I’m sure the Nevada was the healthier of the two. While I enjoyed the raw halibut and the tang of the lemon slices, I have to admit that the Lilly was my favorite. Man, it tasted good! I relished it every bit as thoroughly as the super sweet MaryJean Praline. In keeping with my live-in-the-moment-at-least-for-tonight philosophy of savoring rather than restricting, I ordered dessert, too. 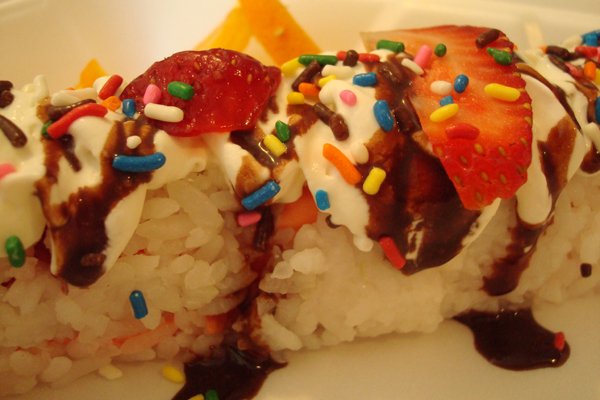 The Strawberry Fields Dessert Roll was made with strawberries, banana and cream cheese, rolled on soy nori with sushi rice, topped with fresh fruit, whipped cream, chocolate syrup and sprinkles (or, as we like to call ’em back home, “Jimmies” J). Oh my word! It was scrumptious!! As with the coffee, I didn’t eat everything. I finished the Lilly, left some of the Nevada and shared a few bites of the Strawberry Fields with a lady sitting a couple chairs down for me. In return, she gave me a sip of her chilled sake. It was strong with an icy bite. I was glad to have had a taste but wouldn’t have ordered one of my own. It was fun to talk with her, though. There’s something wonderful about sharing food, especially with strangers. I learned that my sort-of dining companion was gluten-intolerant, and I was able to suggest that she pick up a copy of Living Without, a great cooking magazine devoted to people with allergies and other food sensitivities. Neat! It was a terrific evening, particularly the freedom I allowed myself to just enjoy… and not worry about calories or the scale. Lo and behold, indulging myself like that did not lead to out-of-control bingeing! In fact, I lost a pound after my trip. Is there a lesson there, perhaps? It was also cool because I made a point of doing something just for myself, taking advantage of the time away from my BF rather than being sad over it. My BF doesn’t like sushi. He’s basically a meat-and-potatoes kinda guy who doesn’t like anything that’s even remotely exotic. As a consequence, we don’t go to sushi restaurants together. I figured I’d make the most of being apart by treating myself. It worked out *so* well. It was a boost on so many levels. I plan to follow the same course whenever the opportunity presents itself. Entry filed under: food review. Tags: local food finds, trying food while traveling. Another Mexican Clean-Eating Discovery	Mind over magazine?